Sparks Ever After: Jingle Bells! Jingle Bells! Is anyone else ready to start decorating for Christmas? You know, even though it's only the first week of November and we still have Thanksgiving to celebrate? I'm usually the person who wants to puke at the first sign of red and green before Thanksgiving, but for some reason this year is different. Maybe it's because it will be mine and Steven's first Christmas to celebrate together in our new home. Or maybe it is because I have already picked out the perfect spot in the living room to place the tree. Whatever the reason is, this girl is ready to put on a Christmas hat and sing Jingle Bells at the top of my lungs. I think I've asked Steven everyday for the past week if I can start putting out Christmas decorations. 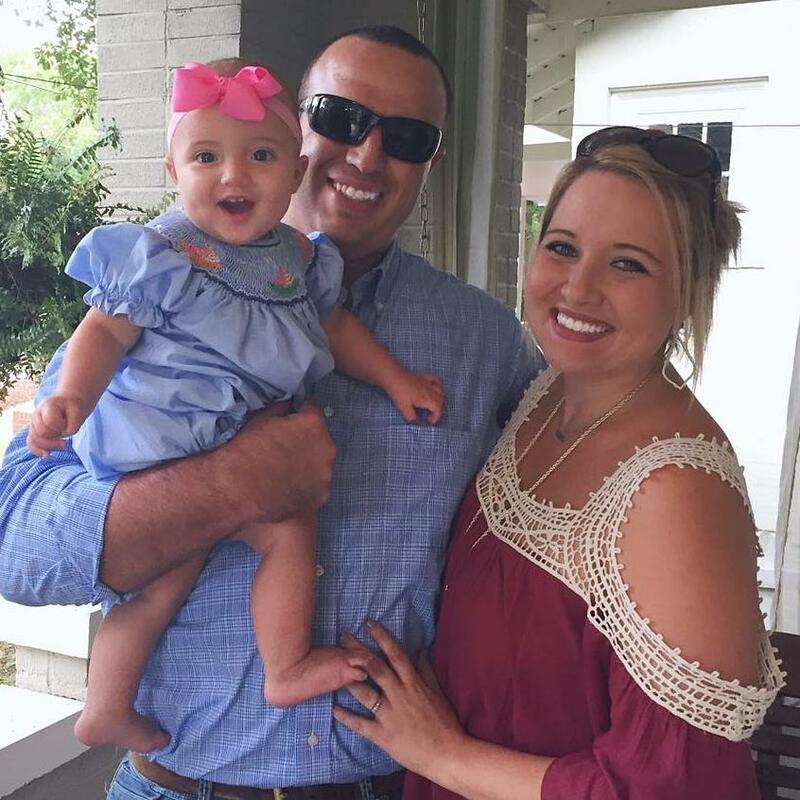 And I think he has cut me off mid-sentence with a "who is this crazy chick I'm marrying" expression on his face and a stern "no" every single time. I was starting to give in to his request to wait until after Thanksgiving to start talking all things Christmas (like normal people) until I came home few days ago to see this sitting in my backyard. 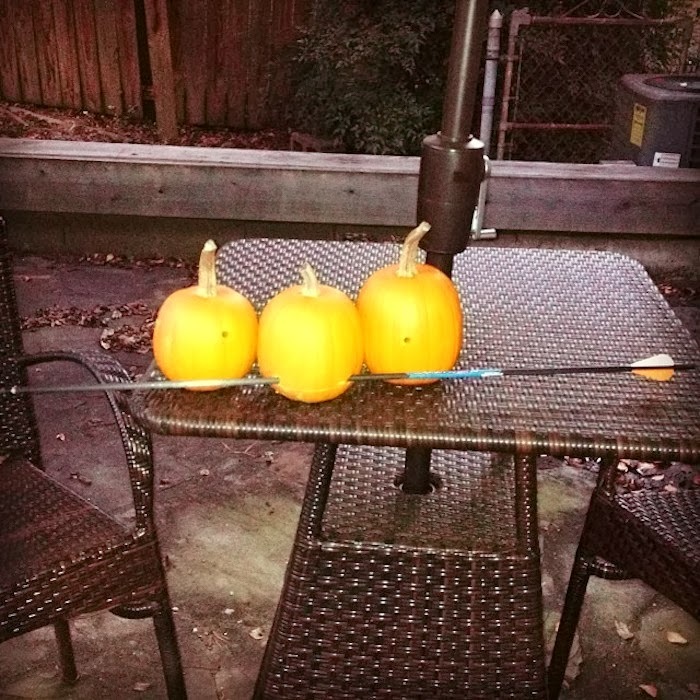 That would be an arrow still sitting in one of my pumpkins and two holes in the other pumpkins. Someone decided to use my pretty baby pumpkins for target practice and now they are ruined. His excuse? Halloween was over. What he didn't realize was that these were not halloween pumpkins (they weren't carved). These were just plain ole fall pumpkins, meant to last until Thanksgiving night where they were then to be trashed to make room for Christmas garland. Since my baby pumpkins will now be trashed a few weeks earlier than expected, I suppose it only makes sense to fill the void with Christmas decor. Am I right? I may or may not have pulled the Christmas boxes out of the back of the closet after this little incident (hint: I did), but I'm resisting the temptation to start decorating the house. This probably has something to do with the fact that we are still the new neighbors on the block and we don't want to be known as the crazy Christmas people who begin decorating before Thanksgiving. I mean, I've got to keep up our reputation as nice, normal people. Don't let them find out who you really are too early or you'll scare them off for life the next five years that you plan on living there. 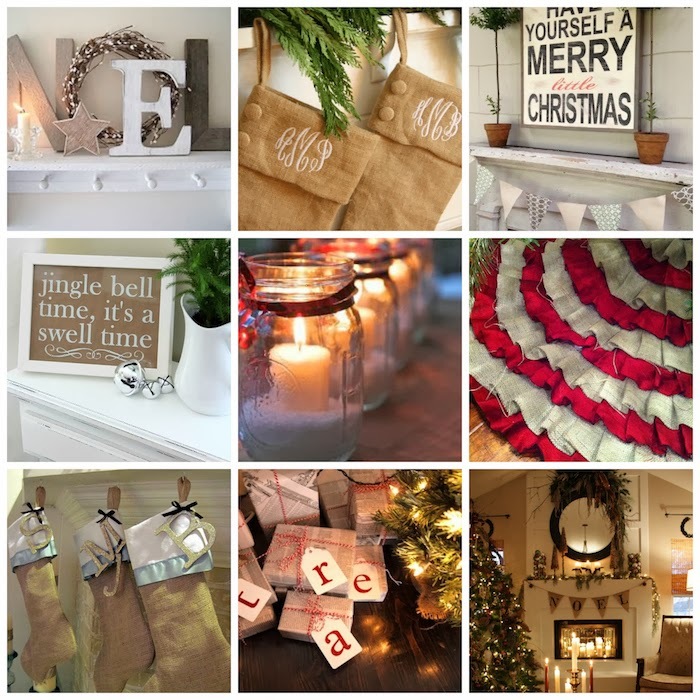 Anyway, to suppress my urge to decorate I have taken to Pinterest to find inspiration for what I want our house to look like for our first Christmas here. These are a few things on my inspiration board. I'm going for a look that matches our house (a little rustic, a little vintage, a lot homey). I love the use of burlap for the stocking and Christmas tree skirt. I think Burlap may be my central focus this year (kind of like it's the focus for everything in my life) and I will work from there. Overall I think Pinterest and my inspiration pins may be suppressing my desires for the moment, but we all know that won't last. Steven is going out of town this weekend and I can almost guarantee that if I stay in town the house will be full of Christmas cheer by the time he gets home on Sunday. I'm off to create Christmas cards. We did not carve our pumpkins so I am pretty sure they will be smashed soon..poor pumpkins! haha! I haven't wanted to decorate yet, probably because I still have all of our pumpkins and gourds, but I have been working on designing our Christmas cards!! I love all of your Pinterest ideas. Love this inspo pics! I'm so anxious to get my decor out - fortunately hubby doesn't care what I do with the house, so I'm starting this weekend!! Umm those are total fall pumpkins!! I give you full permission to go all red and green on him now! Woohoo!! I'm with you girl. I'm currently blasting Christmas music on Pandora. Teehee! I know you won't judge me! Love those pins!!! I can totally relate! The Lifetime and ABC channels already have Christmas movies playing so decorating should be okay, right? I do love this time of year! Oh Lord no! Christmas stuff is not ok until after Thanksgiving...and preferably not even until at least December 1st. It's still a tad early for Christmas and I even have the excuse that our Canadian Thanksgiving passed a few weeks ago! :) In the coming weeks, I'm going to be all over it! woohoo! OMG! We share a brain. I can't wait to decorate our house, but as you know we just bought our first house, too. lol. That must be it!! I LOVE that Christmas tree skirt! I'm the same way - I have started planning my Christmas decorations the day after Halloween - but I'm holding off. I'm almost done with my shopping though! Tis the Season!